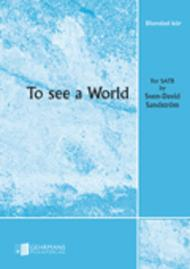 To see a world composed by Sven-David Sandstrom. For SATB choir divisi (a cappella). Octavo. Language: English. 4 pages. Duration 3 minutes. Published by Gehrmans Musikforlag (GH.GE-11328).ISBN 979-0-070-11328-1. With Language: English. 185 x 262 mm inches.Willam Blakes kanda dikt om att se universum i sandkorne.